Victor Hugo remains France’s greatest poet. In the UK, he is known for his two famous novels; all the rest, including his vast output of wonderful poetry, is largely neglected. 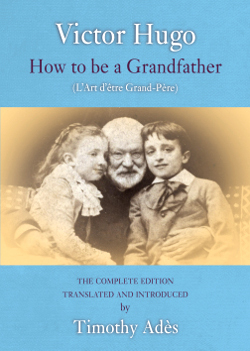 L’Art d’être grand-père (1877) was his last book of poetry, at a time when he had lost almost all his family except two young grandchildren. His musings on childhood, old age, politics, history, the natural and animal kingdoms, are poured into these poems with a torrential energy. Appended are Hugo’s epic accounts of the great Napoleonic disasters: Moscow, Waterloo and St Helena. She start and take flight. The birds and my family. In the ceiling’s deep shadows.